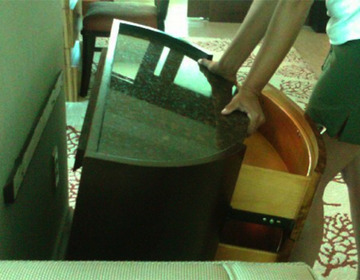 The photograph attached herein shows what can result when furniture is not properly attached to a hotel room wall. The unexpected threat of tipping furniture can cause death and severe injury to a child. The photograph with this nightstand shows how the chest physically removed from the wall when slight pressure (via the weight of a child) is applied in a downward axis. The subject chest fell on a two year old breaking her leg. This attachment was improperly installed, defective, and could have easily been fastened with a 3 inch wood screw through the back of the chest. Recently, much news has been reported regarding heavy armoires and televisions that were not wall mounted causing death and injury to children. If you have suffered a hotel accident and need a Las Vegas Hotel Attorney, call the law firm of Benson & Bingham.